River North Solutions, Inc. (River North) was founded in 2002 in Chicago, Illinois. Since its inception, River North has supplied experienced professionals to guide hospitals across the country through Hospital Information System implementations, upgrades and conversions. 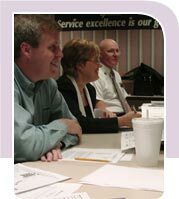 In 2005, River North launched a second service line centered around systems engineering and requirements management. River North has also developed strategic add-on tools to boost productivity in the areas of Requirements Management and document generation/publishing. River North Solutions’ professionals help our clients become more efficient, cost-effective and competitive. Our strength lies in our considerable expertise and business experience in efficient project management and product development methodologies and deep domain knowledge in critical business systems. Mike Parro is a Principal of River North Solutions. Mike has over 20 years of Information Technology and management experience in the healthcare industry. His skill set includes project management, integration, installation, implementation, programming, systems management, and training. He managed successful implementations in over 30 healthcare systems. Bob Parro is VP Business Development and Product Development at River North Solutions. Bob has over 30 years of product development design and management experience in the automotive, aerospace and healthcare industries. Bob was the 2011 INCOSE (International Council on Systems Engineering) Chicagoland Chapter President and current INCOSE Risk Management Working Group Co-Chair. Bob is also on the IEEE Board of Directors. Copyright 2016 River North Solutions, Inc.